An exciting new theme. Past themes include - Outer Space, Feathered Friends, Backyard Science, Ocean, and Mad Scientist. "One Off" boxes for purchase called Discovery Boxes. They pack a lot of fun and learning into convenient, eco-friendly packages. 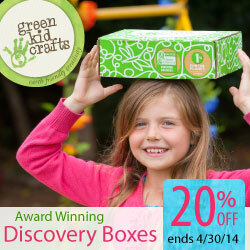 Developed by teachers, crafty moms and STEM experts (science, technology, engineering, and mathematics) to support key developmental skills for kids ages 3-10, each Discovery Box celebrates creativity with craft projects and activates thinking, questioning, inquiring, and original creation as we guide children through fun science experiments. Each Discovery Box contains 3-4 Creativity and STEM Science Kits, extension activities, and a 20+ page themed Green Kid Activity Guide. Themes currently available include - Dinosaur, World Music, Ocean, Kitchen Scientist & Garden. Eco Friendly party favors. A select number of the kits from the boxes are available for individual purchase as party favors, stocking stuffers or as activities to enjoy at parties. I think they are also good to support specific learning goals in home & school. Each Birthday Activity and Party Favor comes in its own Green Kid Crafts birthday bag! A special discounted rate applies for group orders. Save 20% on orders of over 20 items with coupon code BIRTHDAY! Themes include - My Weather Station, Sailboat, Rocket Launchers, Shooting Stars and Paper Making. STEM kits - STEM Science Kits make science fun and exciting for kids through hands-on science, technology, engineering, and mathematics (STEM) experiments. The kits facilitate thinking, questioning, inquiring, and original creation as children are guided through the scientific inquiry and engineering design process. Themes include - Cloud Finder, Weather Station Kit & Sun Prints. My intention had been to post an 'opening the box' video here. I was setting up the equipment, with the kids and went off to answer the 'phone. I came back to find that, such was their excitement, they had started without me - but I went with the flow! So here is the slightly badly focused, raw reaction of our 6 & 7 year olds opening the box! As you can see they were very pleased with what they found in the Kitchen Science Discovery Box and you can read the full review of the box here. Click here to find out more about Fun, creative and earth-friendly craft projects, delivered each month by GreenKidCrafts Or on the button below to take advantage of Aprils special offer - but be quick they won't last long! 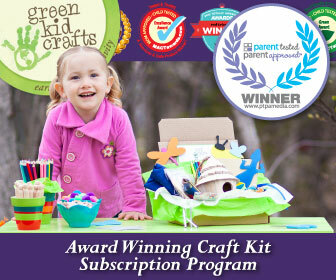 One of our lucky readers can win a three month subscription, donated by the generous folks at Green Kid Crafts. The giveaway is open to the US residents aged 18+ only. It starts on 04/09/14 at 0001 PST and ends 05/12/14 at 2359 PST. Enter using the form below.